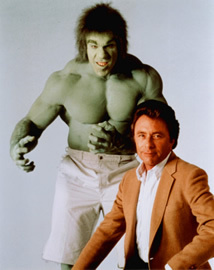 Based on the Marvel comic, this live-action series features the life of Doctor David Bruce Banner (Bill Bixby), a physician/scientist who is overcome with grief after the tragic death of his adoring wife. Preoccupied with the thoughts that he was unable to protect her from harm, he studies people that were in similar situations and who gathered superhuman strength to save their loved ones. He comes to the conclusion that high levels of gamma radiation is the cause of the strength and injects himself with it to test his speculation. But unbeknownst to him, David dispenses a much higher dose than intended. Now, when he’s irritated or stressed, he transforms into a seven-foot, muscular, green being named The Incredible Hulk (Lou Ferrigno). Once he’s calm again, he returns to his normal appearance with no memory of what happened. Banner seeks the help for a cure from research partner Dr. Elaina Marks (Susan Sullivan) and she helps keep his secret from the world. In an attempt to stay a few steps ahead of tabloid reporter Jack McGee (Jack Colvin) while he tries to find a cure, David travels the country and ends up helping those in need in his own way. It was a great series treated poorly by CBS. The show had another two seasons left in. CBS got cheaper and cheaper with the budget and that hurt. The series should have had a proper ending (not those three movies they did on NBC with a fourth one in preproduction (they were going to learn the Hulk can’t die and Johnson had no involvement with the movies). Banner should have found a cure and McGee (who you saw less and less toward the end of the series due to budget cuts) should have been allowed to find out the truth. I also think if Del Frye had escaped at the end of the “The First” episode ,the series would have had an extra push and lasted a couple of years longer,and they could have done that idea of David Banner giving his sister a blood transfusion! This was my favourite series as a child,and I’m glad they made 3 TV movies and wrapped it up,but I wish Mr.McGee had been there for the death of the Hulk.